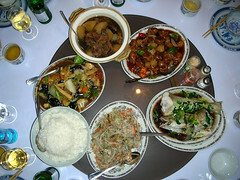 and then a five dish culinary feast including stewed beef with Chinese melon, sweet and sour pork, steamed cod, chicken chopsuey and tofu with spicy vegetables. Believe me, the troupe gave a lovely performance. I heard they have won 6 gold awards and 2 silver awards in the friendship Art Festival held in Pyongyang, North Korea, in which 80 countries from around the world participated. 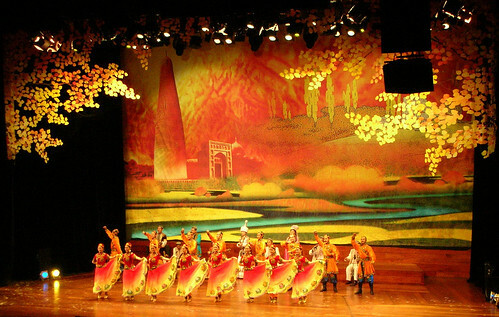 They have also visited Moscow in 2002 together with China’s Olympic Bidding Committee and staged a successfull performance. This post is also a part of Lifecruiser’s Cyber Cruise. Read more about: Our Cyber Cruise Event and here is The Cyber Cruise Archive. What a great evening, Renny. I love authentic Chinese food, the spicier the better for me. Hope you and Diane have a wonderful weekend. I’ll bet it’s getting cooler there and the days are getting shorter, as they are here. I do agree: Chinese are very tasty! Thanks and I do hope you and your family will have a good one too! Its about to get more chilly and the days are shorter now, but then again the nature is getting more colorful. What a great evening you must have. I love Chinese food. My daughter’s birthday is today and for her party a week from now, she wants me to do Chinese cuisine. I send my Birthday Greetings to your daughter then and she made a great food choice! Congrats! I’ve awarded you with the “Best Kept Secrets” blogger award, which keeps a running blog roll of all awarders & should boost your readership & the awareness of your blog considerably. You can pick up the award at my music blog, http://musicunbound.blogspot.com. Enjoy! Woooww, I am so happy! This is such an honor – thank you very much! I’ll be right over and will think of the best way to announce this honorable award! Oh Congrats on your “Best Kept Secrets” award. I been trying to keep you as my little secret for years but you keep getting out!!! The article looks really great! and Oooooooooooohhhh I am so dying for Chinese food right now, you wouldn’t like to surprise me for dinner would ya???? Thank you my dear and remember you are a great contributor on my blog and one of the reason for this award! I hope your happy with my surprice for tonight – don’t tell anyone!! LOL at “a bit spicier”. There is nothing spicy to be had here! I could not make it to the music because I was salivating over dinner. What a disappointment because we are having Kessler for dinner! The dancers video is lovely, show them before the food (*slobbers*)! Glad I could accompany you in your dinner making then and hope it was as delightful! This was truly a treat!! very enjoyable. Our neighbors came back from China last year after living and working there for 3 years. I have heard very interesting stories! Glad you liked it Mar! Yea: the world has become smaller and I hope you’ll share some of the stories with us! I would so LOVE to have been there, but this is the next best thing! I can almost taste the food. Absolutely glorious, both the food and the dancing, costumes, music, everything. A very special experience and it’s great to be able to share it. Thank you. Experience in blogsphere is a great substitute I know. I’m glad you had a good time reading and watching. Fantastic food & performance! I love their costumes! Very extravagant! Have a great weekend to you renny & to your family! I knew you would love this CheH and glad I could share it with you as an expat Filipino! Wish you all a good one too! Its always nice to see new readers – welcome back any time! And I’ve visiting yours too of course and really liked it! Thanks – it really is exotic Tor! I do hope your having a great time celebrating Anna’s birthday on top of Norway! outstanding photos! What a fun time for sure. Learning, eating and enjoying culture! Thanks for sharing. lol at ‘Chinese are very tasty’. Yup, I’m tasty. Make plans to come visit me in Singapore. I’ll bring you around to see our beautiful tropical island and taste our local food. er… it’s very hot here, most of the times. You know I have been in Singapore once – 10 years ago – but would love to go back and have a guided tour with you! Believe me: I don’t know and are so very sorry about it! See my note to you about it! That’s one of the most breathtaking stage designs I’ve seen to date. Very impressive images captured by your camera for lighting conditions of this nature. Thanks so very much for your nice compliment! I took more than 50 pictures and are glad some came out pretty good. The show looks gorgeous! Beautiful costumes! Great post, especially the pictures and video. I had the pleasure of visiting Beijing recently, so I was able to eat ‘authentic’ Chinese food finally and see a lot of historical monuments in and around Beijing. Incidentally, other than Indian food, Chinese food is the other most commonly available cuisine in India. oh it looks like it was really a wonderful tie to experience a different culture. the dance troupe must have been such a highlight. just marvelous. Everything is so appealing to the eyes and ears from here! I’m gonna look at your pictures more in flicker! Y’all must have had so much fun! Glad you liked it and thanks for visiting my Flickers too! LOL! *clapping* Oh, Renny! This just looks like such a FUN evening out! WOW! I am loving it and I wasn’t even there! I do LOVE Chinese food – but confess, that while I have tasted other things, I can only ever order Moo Goo Gai Pan – because I just love it soooooooo much! I do not care much for the spicy Szechuan food though. I like sweet and sour almost anything though! LOL! That show looks like it was just fabulous! SO bright and colorful and exotic! Mmmm! GREAT for you to have such an experience!!! Wow! What a nice day. Good food, great performance. I guess you know understand my love for Asia! Glad I could share it with you too Sidney and I do understand your love for Asia and my compliment for the way you show it on your photo blog!! I like Chinese Food but more Canadian Chinese and not anything with fish. 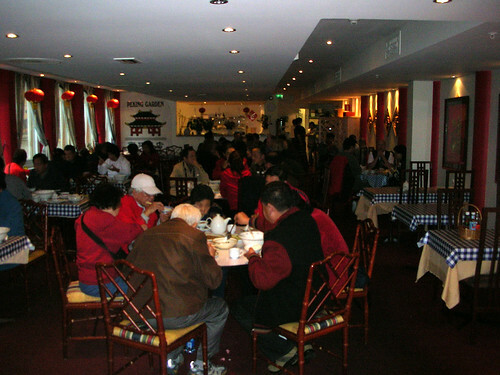 I love the rice dishes and vegetables, chow mein and chop suey. They don’t seem to be that big on dessert except for almond cookies and fortune cookies. Very bright and colourful show. I do understand Ruth, but aren’t you tempted to try it the original way once in a while :D We did not had time for dessert, but I’ve heard they are nice and sweet. How colourful that dancing is. I enjoy Chinese culture like that, it’s so different to what we’re used to. 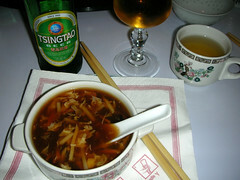 As for Chinese food, oh joy! It’s one of my favorites and it’s pretty good for you, too…makes a nice change. Thanks for the interesting post, Renny, I’m glad you had such a great night and that you shared it. I do agree; different and exotic! The food have become one of my favorites too! Your welcome – I love to share with the rest of the world you know. this looks like a spectacular performance Renny…….and the costumes are exquisite !!!! What a wonderful evening you must have spent ! And your video is very nice. I just started to use this function too on my camera and now of course I like it very much it’s so much more lifely then photos. I am back from Italy into a “normal” world at least concerning internet connection ! I have never had such a bad connection since I am blogging ! Not even from Egypt or Turkey. From 1 h Internet I could use maybe 45 min at the beginning and then 15 the last 3 days ! It was awful. We arrived home at 1.30 pm made the trip in two shots of course. Now I have to catch up on all news in blogworld ! and especially on the Cruise ! So I have a lot to read, lol ! Sorry that I couldn’t comment, because of this bad connection. Sounds fabulous! I love Chinese food, but you made me curious of Norwegian food. Did you ever do a post about the “Norwegian cuisine”? Renny, We were not there in person, but you brought us to this spectacular show and dining. May we pay the half? Last Saturday in October? You remember? jeah. You have good time Renny! I’d like to taste all this food! And the show!!! The colors are wonderful! Glad I could share it with you Claudie! Nice Chinese food. I’m still curious about Norwegian food.. Thanks! There are plenty of posts about Norwegian food here if you scroll down! Interesting read, that was. My wife is Chinese, so we have lovely home cooked Chinese food all the time. Im trying to encourage her to add them to this chinese recipes website too, but her english isnt really up to it yet. I’ll subscribe to your site for later reading if you don’t mind!